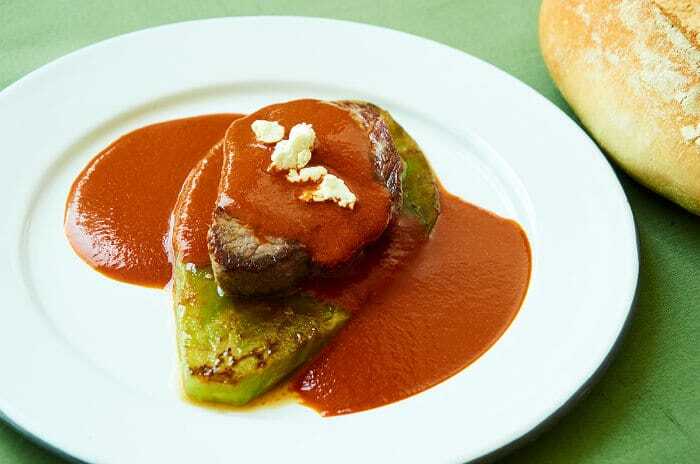 Beef tenderloin served with a rich three chile sauce and cactus on the side is popular in the state of Querétaro. 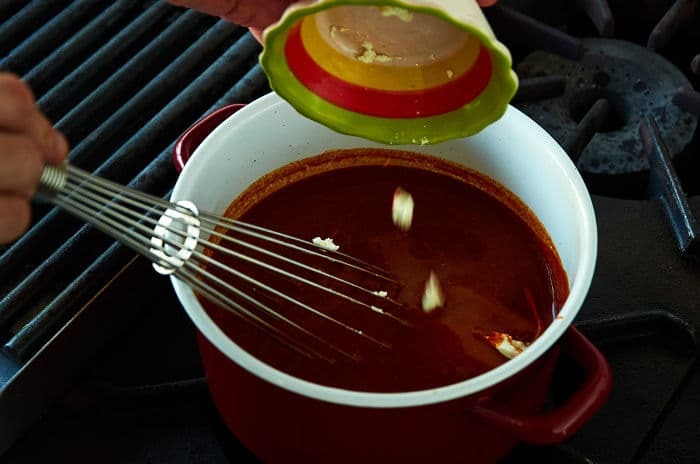 The sauce is prepared ancho chile, pasilla chile and chipotle chile with the addition of tangy goat cheese which makes the sauce even richer and more flavorful. It looks spectacular on the plate, green, white and red just like the Mexican flag. Start by gathering everything you need to prepare the dish. 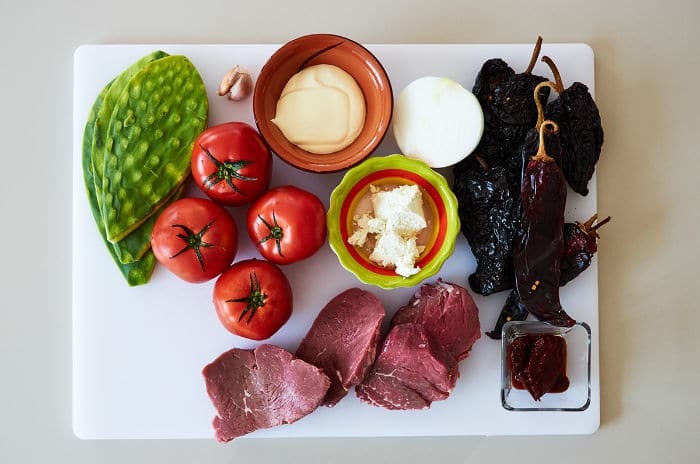 The ingredients are beef tenderloin fillets, ancho chile, pasilla chile, chipotle in adobo, tomato, onion, garlic, heavy cream, sharp goats cheese and cactus pads. 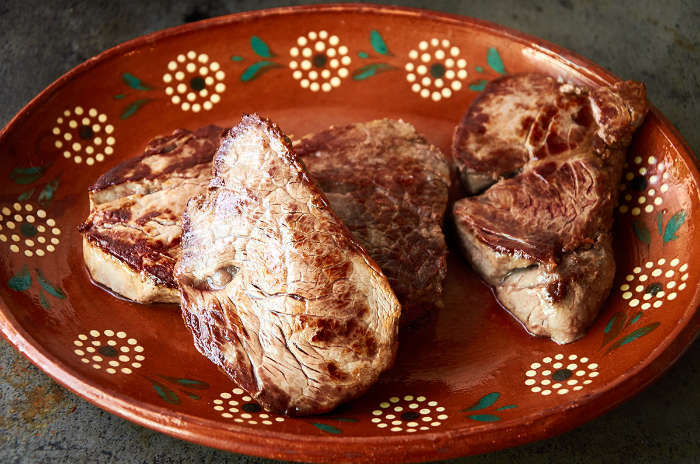 The recipe for the sauce makes about 4 cups which is enough for a very generous serving with each beef fillet or to save some to later use, and you will want some for later. It’s that good. Start by prepping the chiles. 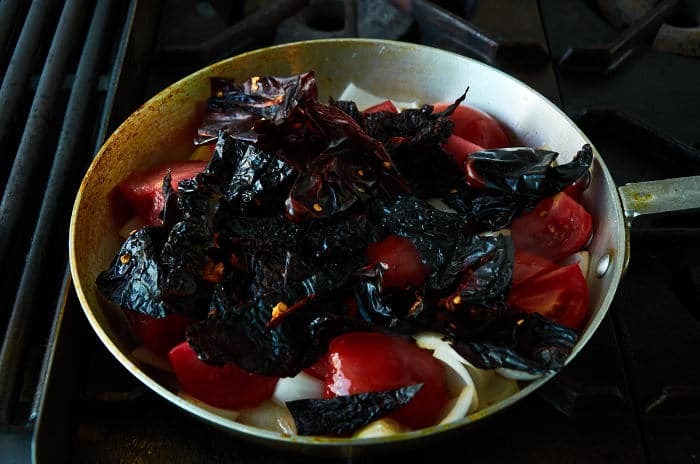 Remove the stems and seeds from the ancho and pasilla chiles. You do not need to remove the veins. Don’t worry if a few seeds remain stuck to the chiles. The seeds are edible. 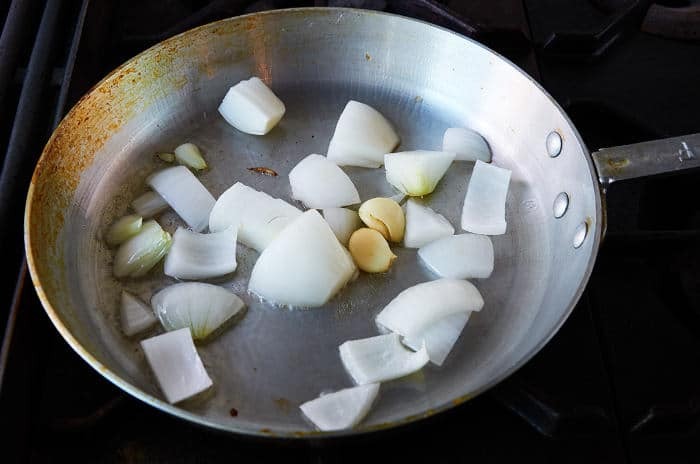 Fry the onion and garlic over medium heat for 5 minutes in 2 tablespoons of oil until the onion just starts to turn translucent. Add the tomatoes and dried chiles to the pan. Continue to cook over medium heat for 5 minutes stirring periodically. Do not add the chipotle yet. Add just enough water to barely cover the tomatoes, onion, and chiles. 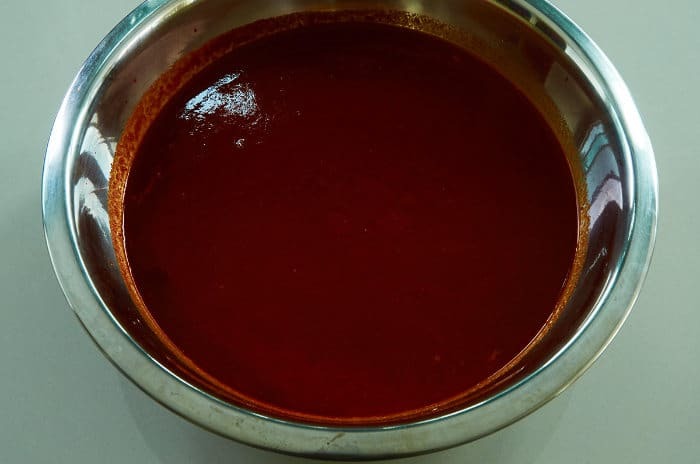 Reduce the heat to low and simmer for 15 minutes to reconstitute the chiles. Next, you will blend the base of the sauce until smooth. Add the tomatoes, onion, reconstituted chiles and the chipotle in adobo to your blender. Blend in 2 batches. 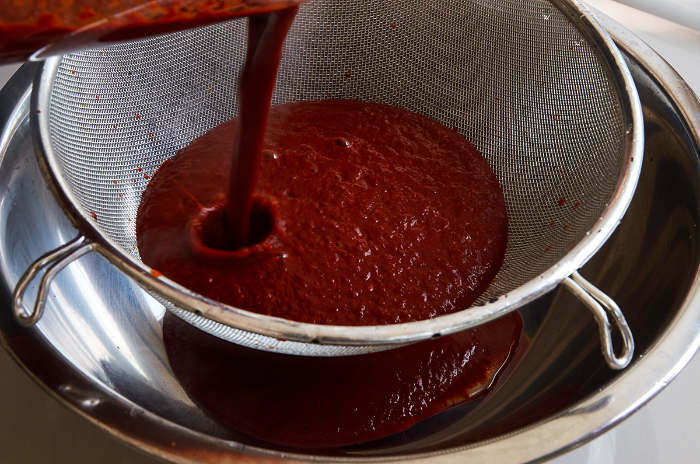 Strain the chile base with a medium strainer to remove the chile skins from the sauce. Preheat a large pot over high heat. Add 3 tablespoons of cooking oil to the pot. Pour the blended and strained chile base into the hot to fry it. Yes, that’s correct, fry it. 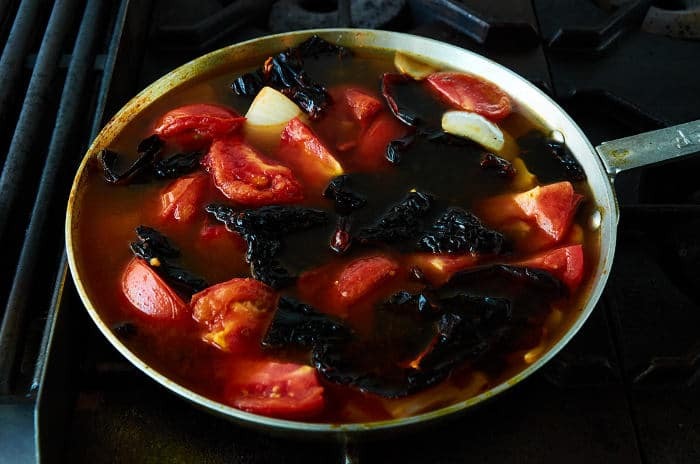 This step develops flavor and depth in the sauce. Be careful because the oil may spatter. Once all chile base is in the pot reduce the heat to low. Simmer for 20 minutes. Add the 3 ounces of goat cheese to the chile base and stir with a whisk until the cheese has fully incorporated. After the cheese is fully incorporated add the cream and stir with a whisk until the cream has fully incorporated. Simmer for 10 minutes stirring occasionally to thicken the sauce. After 10 minutes turn off the heat. 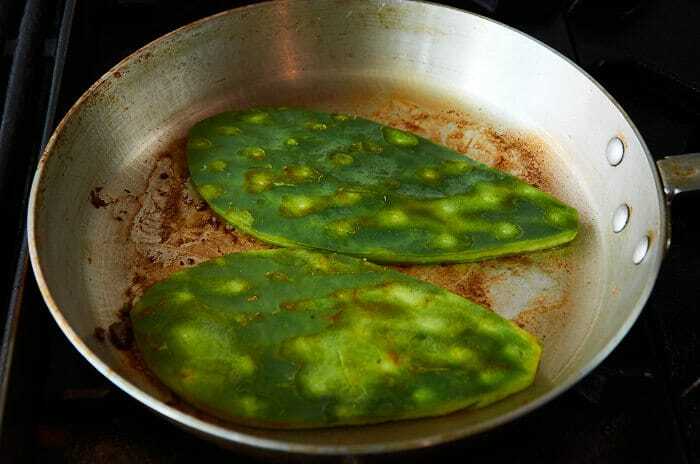 While the sauce is simmering, cook the cactus pads which serve as a base for the beef when you plate the dish. Add 2 tablespoons of cooking oil to a medium hot pan. Cook both sides of the cactus for 3 minutes. The cactus is cooked when it has turned a darker green color and is starting to brown. Preheat your pan over high heat. Add 4 tablespoons of oil. Salt the meat well on both sides. 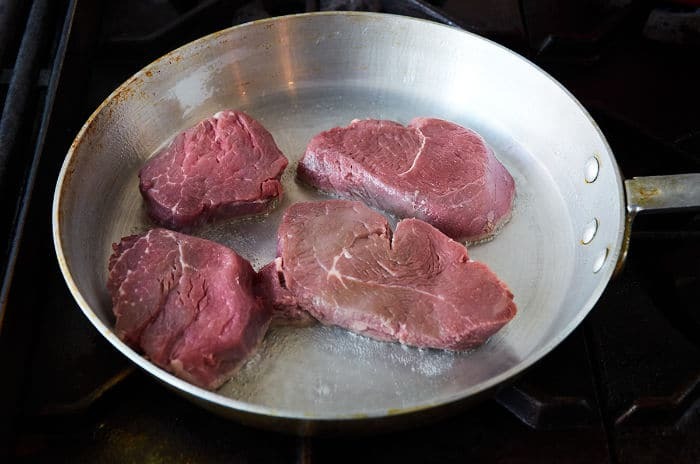 Add all four fillets to the pan. When the fillets are nicely browned turn them over, about 3 minutes. Nicely brown the fillets on both sides. The meat will still be pink in the middle. 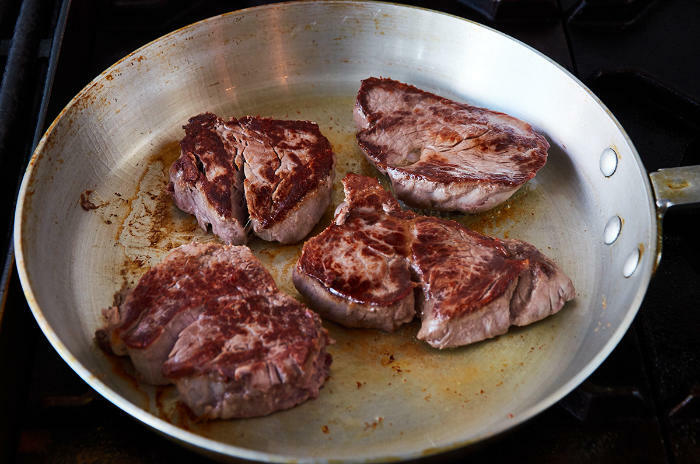 Remove the tenderloin fillets from the pan and let them rest for 3 minutes. To each plate, add one cactus pad. Place 1 tenderloin fillet on the cactus pad. Pour about 1/2 cup of sauce over the fillet. Garnish with 1 teaspoon of crumbled goat cheese. Serve with a French roll. Serve with more salsa if you like so that you can sop up all of the wonderful flavors with chunks of the French roll. Looks good, doesn’t it? Provecho! 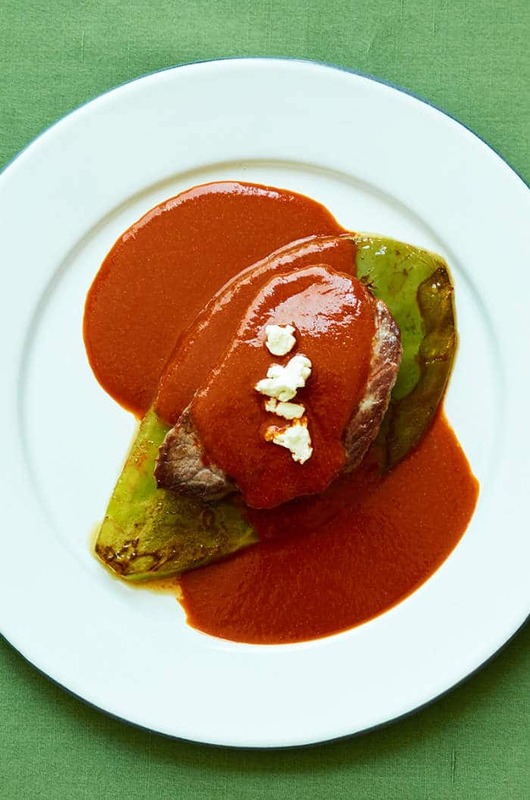 Querétaro style beef tenderloin served with a rich three chile sauce and cactus on the side. 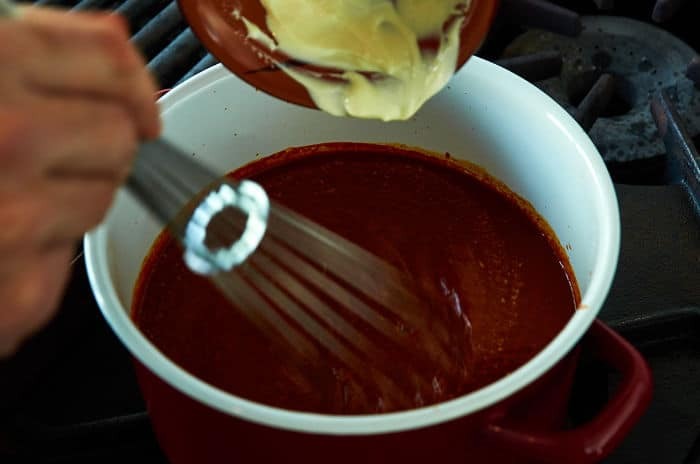 The sauce is prepared ancho, pasilla and chipotle chile with the addition of tangy goat cheese. 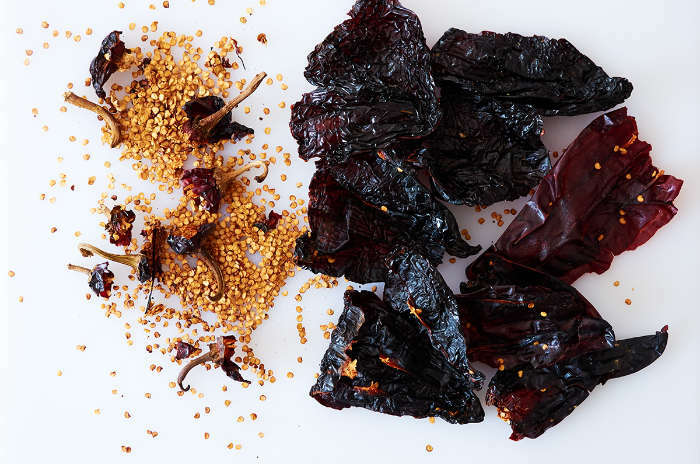 Remove the stems and seeds from the ancho and pasilla chiles. Reserve the chipotle chile. Preheat 3 tablespoons of oil in a frying pan. Fry the onion and garlic over medium heat for 2 minutes. Add the tomatoes and dried chiles to the pan. Continue to cook over medium heat for 3 minutes. Do not add the chipotle yet. Next, you will blend the all of the base of the sauce until smooth. Add the tomatoes, onion, reconstituted chiles and the chipotle in adobo to your blender. Blend in 2 batches. Preheat a large pot over high heat. Add 3 tablespoons of cooking oil to the pot. Pour the blended and strained chile base into the hot to fry it. Be careful because the oil may spatter. Once you have poured all the chile base is in the pot reduce the heat to low. Simmer 20 minutes. Add the goat cheese to the chile base and stir with a whisk until the cheese has fully incorporated. After the cheese is fully incorporated add the cream and stir with a whisk until the cream has fully incorporated. Simmer for 10 minutes stirring occasionally to thicken the sauce. Add 2 tablespoons of cooking oil to a medium hot pan. Cook both sides of the cactus for 3 minutes. 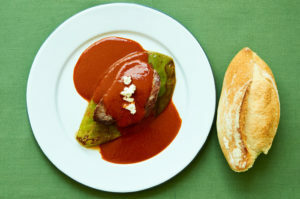 The cactus is cooked when it has turned a darker green color and is starting to brown. Nicely brown the fillets on both sides. To each plate, add one cactus pad. Place 1 tenderloin fillet on the cactus pad. Pour about 1/2 cup of sauce over the fillet. Garnish with 1 teaspoon of crumbled goat cheese. Serve with a French roll. If you don't care for the taste of goat cheese you can replace it with cream cheese which will give the sauce a very smooth rich taste. You can substitute corn tortillas for the French rolls.